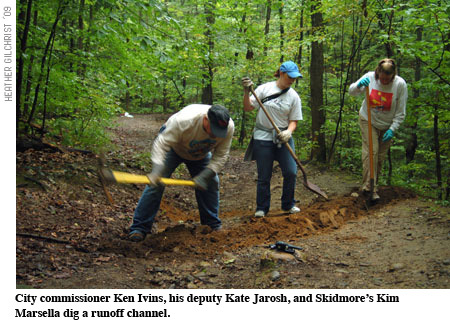 Trail-maintenance projects and guided tours highlighted a North Woods community day this fall. The event was organized by Saratoga’s commissioner of finance, Ken Ivins, and Skidmore’s community relations office, along with students and faculty from environmental studies and biology. The work ranged from building stairs in a steep trail, to digging runoff channels, to placing stepping stones across streams. Lumber and other materials were donated by Saratoga’s Allerdice Building Supply. Also this fall Skidmore took part in Leave Your Car at Home Week. The student cycling club offered free bike repairs, car-pooling was arranged, and by the end of the week more than 100 students and employees had cut more than 5,000 miles from their usual driving, sparing some two tons of carbon dioxide emissions. Erica Fuller, campus sustainability coordinator, noted that if this same group continued its reduced-driving habits for one year, they’d save 900 tons of CO2 emissions.